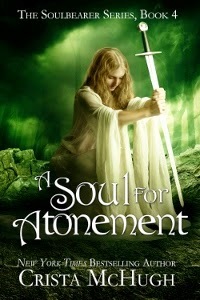 A Soul for Atonement: Book four in The Soulbearer Series by Crista McHugh. I will be honest and start off by saying this is the first book by Crista McHugh that I have ever read, it will also be the first of many. I loved this book. Even though I am starting this series on book four, I could totally get into the book and follow along and bond with the characters. She gives you a bit of background during the book so you can start with book four and you can become immersed in the story. The premises for this story I found refreshing and original. Arden is the soulbearer for Loku the God Chaos. Loku has been torn from his body and then his body was cremated. Loku is not a nice God nor is he, I feel altogether evil. He is tricky and a bit self centered, after all he is a God who must dwell in a mortals body, but he is not in control the mortal is in control of him, or at least they had better be. Loku must be contained or he will drive the "soulbearer " insane. Dev is Arden's protector. However in this book, it is up to Arden to save him. Dev must pay for the past crime of the previous soulbearer, who stole an ancient relic from another Gods temple. The price to atone for that crime is Dev's death, unless Arden can recover the stolen relic and return it in time. In order to do that Arden must venture into the world of Chaos. The world of Chaos belongs to Loku, and it is where his power is the strongest, even without a body. Arden is forced to rely on Callix the one person who seems to hate her and distrust her more than anyone. Can Arden trust Callix to protect her, when in the past he was such a coward? Will Callix survive what the God of Chaos has in store for him? The story hooks you in, and has you turning pages until you realize you are at the end, then you just want the next book. Well written, fantasy with a love story, and danger interwoven in a masterful way.